Roof repair and water proofing have been deemed two of the most important and necessary steps to safeguarding the future of the Beecher Mausoleum. That work is now being undertaken by volunteer labor force through the combined efforts of the United Union of Roofers and waterproofers Local #11 and the International Union of Bricklayers and Allied Craftworkers, District Council 1 of Illinois and Berglund Construction would not have been possible without the efforts of Landmarks Illinois’ continued support as well as Berglund Construction, Chicago, which is overseeing and coordinating the work to repair and replace the entire roof system, and deteriorated drain scuppers, badly damaged by the passage of time and neglect. The work is expected to be completed by the end of the month. 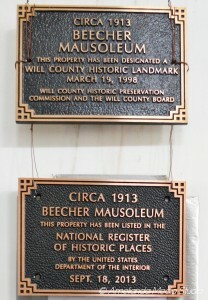 Landmarks Illinois , the only statewide not-for-profit organization dedicated to the preservation of Illinois historic places, approved the Beecher Mausoleum application to the National Register of Historic Places in September 2013. In addition, the agency placed the mausoleum on its list of “Illinois Ten Most Endangered Historic Places.” Moreover, the agency has awarded the mausoleum a “Heritage Grant” of $1500 to aid in restoration efforts. To celebrate this achievement and to thank the tireless volunteers, the Beecher Mausoleum’s not-for-profit Guardian Angels Project will sponsor a Fall Festival at the mausoleum. There will be tours of the interior of the mausoleum and information about some of the souls who once lived and worked in the Beecher area and surrounding communities. The festival, to be held from noon until dark Saturday, Nov. 1, is meant to thank the many volunteers that have helped to protect and preserve this local landmark, now recognized on the National Register of historic places. The Festival will carry a harvest theme, but in keeping with Halloween, participants will wear costumes befitting a celebration of the past 100 years. 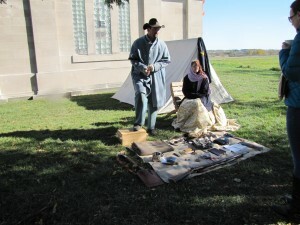 Brian & Jill @ Will County Historical Musuem 9 2014The celebration will also include entertainment from members of the First Michigan Engineers & Mechanics Co E, a group of Civil War, World War I, and World War II re-enactors who will be setting up tents, displays and will perform a rifle firing drill. Additional funds will be raised through donations at the event with the sale of homemade baked goods as well as home canned items: i.e. tomatoes, pickles, jams. Firemans Park to Mausoleum map (3)Parking at the mausoleum is limited. Additional parking will be available at “Fireman’s Park – 623 Penfield St. Shuttle service to the mausoleum will be provided.